When we were in Skåne the horse flu was going around so we couldn't go into any stables or pastures. We had to view every horse from a distance. Rycerz was just being brought in from pasture so thats why I got a chance to photograph him. He belongs to the Gazella OA mare line, imp in 1845 to Jarczowce. This line is very sucessful, producing both showhorses and racehorses. It is also one of the larger lines with many individuals. It was almost lost during World War I with only three surving mares but one of them would do more than just continue the line, she would make it legendary. This was the mare Gazella II 1914 by Kohejlan OA. The two other mares were Fryga 1914 by Kohejlan 1903 and Gazella I 1907 by Selim. Fryga 1914 left a small branch that has produced some horses imp Sweden, among them the stallions Milagro and Dzahil and the mares Meluzyna and Melhafa-ed-Areg. The branch of Gazella I does not exist anymore, it was lost in World War II. Rycerz belong to the Elegantka branch through her daughter Kamea 1929, the granddam of Rusznica 1955 imp Sweden. Elegantka was also the dam of one of the famous "W" stallions by Ofir, Wielki Szlem ("Grand Slam" in polish). The stallions Wielki Szlem and Witraz miraculosly survived World War II. Many arabians from Poland were evacuated to Germany and endured very tough conditions. The main bulk of stallions from Janow Podlaski reached Dresden during one of the worst nightly bomb raids. The stallions panicked and were scattered all over the place. When Andrzej Krystalowicz (director of Janow Podlaski) reached Dresden in the morning he saw many of his wards lying dead. Finally, he reached the park were Witraz and Wielki Szlem were still alive. Their brave groom Jan Ziniewicz had held on to his stallions during the whole night, even when Witraz's tail caught fire. The leadlines had chafed the skin of his hands. Of 80 stallions evacuated 38 survived, 22 were found dead and 20 were never found at all. Rusznica (Trypolis x Rozeta) had five offspring in Poland before being imported. The mares *Rusalka, Rezeda, *Ruta and Rus were used as broodmares and the stallion *Ruszt was exported to USA. She had *Rutyna by Negatiw at her side and was again in foal to Negatiw when she was imported, resulting in the mare *Rusnega. Her only swedish-bred mare was Rucasja 1969 by *Exelsjor. Rusznica was a healthy and very fertile mare and was exported to France in foal to Madar when she was 21 yrs and had several foals in France as well. 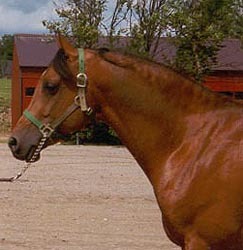 Rucasja was also a valuable mare, producing five broodmares Pohcasja, *Bibusja, Pruszja, Rubinia and Regina and five stallions *Rusazcie (twice Swedish Nat'l Ch), Rousseau, Rycerz, Rukwiel (full brother to Rycerz) and World Champion Rumak.